Ojai’s most famous centenarian, Carl Greenfield, has been selected as Grand Marshall in Ojai’s July 4th Parade. Carl has been a member of Ojai Valley Lions Club for 50 years. He is adored by many. Ojai’s Fourth of July celebrations this year will be honoring more than Independence Day. The town is commemorating 100 years since it officially became known as Ojai and received an architectural makeover spearheaded by glass magnate and one-time resident Edward Drummond Libbey. Organizers of the city’s Fourth of July commemorations have made Ojai’s centennial the theme of this year’s parade, calling it “Celebrating the Libbey Legacy.” They’ve even appointed a 100-year-old Ojai resident and longtime community volunteer, Carl Greenfield, to lead the procession. Kristi McGhee, president of the Ojai Independence Day Committee, said the group is challenging parade participants to go beyond the typical floats seen every year. The committee will award trophies to participants who best embody the parade’s centennial theme, and for the most creative float. Entries so far include members of senior living community Gables of Ojai, some of whom are 100 years old, she said. Greenfield, who turned 100 years old on Jan. 2, said his immediate response was to crack a joke when he heard he’d been selected the parade’s grand marshal. “Well, they couldn’t find an older guy, I guess,” he quipped. 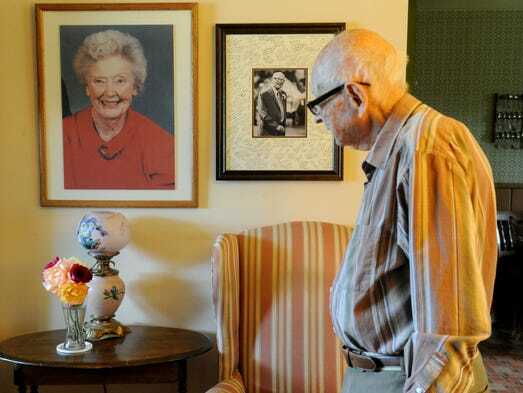 The centenarian has lived in Ojai since 1948. Born and raised in New Jersey, he moved to the city with his wife, Marian, after serving in the Pacific theater with the U.S. Army during World War II. He earned a bronze star for “gallantry in action” and advanced up the ranks to lieutenant colonel. After moving to Ojai, Greenfield worked as a reporter, news editor and city editor for the Star Free-Press, now the Ventura County Star. He retired in 1977 but has continued to work as a volunteer for several Ojai community organizations. Most notably, he’s served with the Ojai Valley Lion’s Club for more than 60 years, a feat that brought Greenfield to the Independence Day Committee’s attention. In addition to the parade, the committee is organizing a free community concert on July 3 at Libbey Bowl with local musicians Darrienne Gross, Kyle Caldwell and 805 Brass, along with a raffle and apple pie contest. The event begins at 6:30 p.m.
As usual, Ojai’s fireworks show will take place July 4 at Nordhoff High School. This year’s show includes live music, a bounce house, a bungee run, face painting and food trucks. Gates open at 5:30 p.m. Tickets can be purchased at the gate or online in advance with the option of a discounted family pass. Proceeds from the event help fund the annual celebrations.